Usually Labor Day marks the end of summer in Michigan. A lot camping sites gradually shut down for the season after Labor Day. However, it looks like we are having a longer summer in 2017. A couple heat waves have brought over ninety degree hot days even weeks upon us. So we take advantage of that and go on camping. The leaves are starting to change colors even though it is still very hot. Mix the beef short ribs and seasonings together. Refrigerate overnight. Pack in Ziploc bag and store it in cooler. 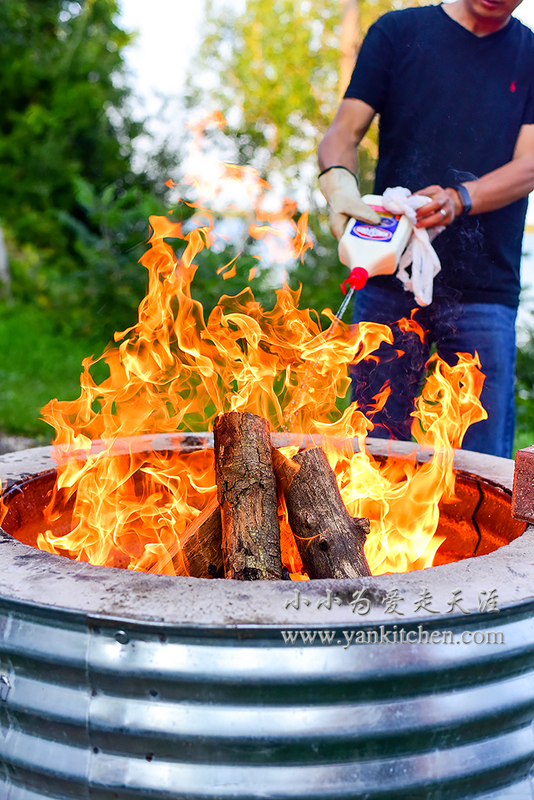 When the firewood is half burned, it is time to grill! Heat a cast iron rack nearby fireside. When it gets hot, add beef short ribs. 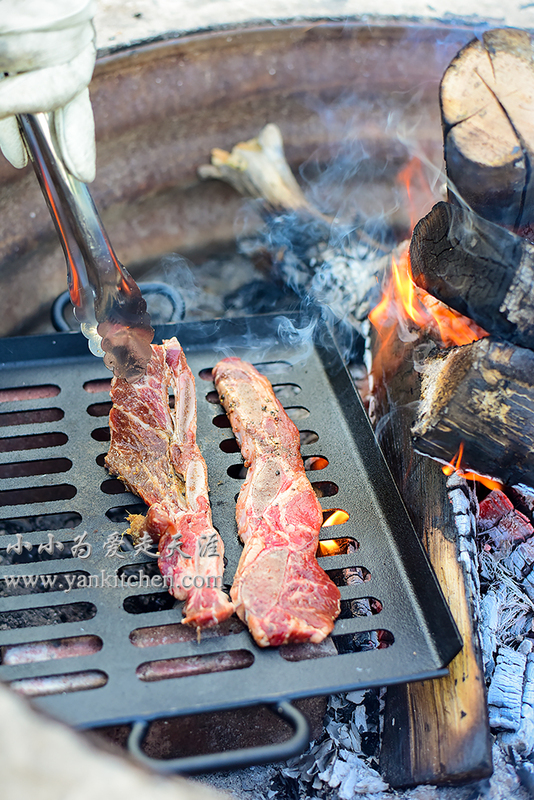 There is usually high amount of fat in short ribs which will prevent from sticking to the cooking rack. The second batch of short ribs is ready. The trick is to perfect campfire grilling is patience. Bacon wrapped scallops and shrimps are next. Sprinkle the scallops and shrimps with sea salt and freshly ground black peppers. Wrap each scallop with a slice of bacon. Secure with bamboo sticks. Skew the shrimps with bamboo sticks too. The firewood is turning to charcoal. 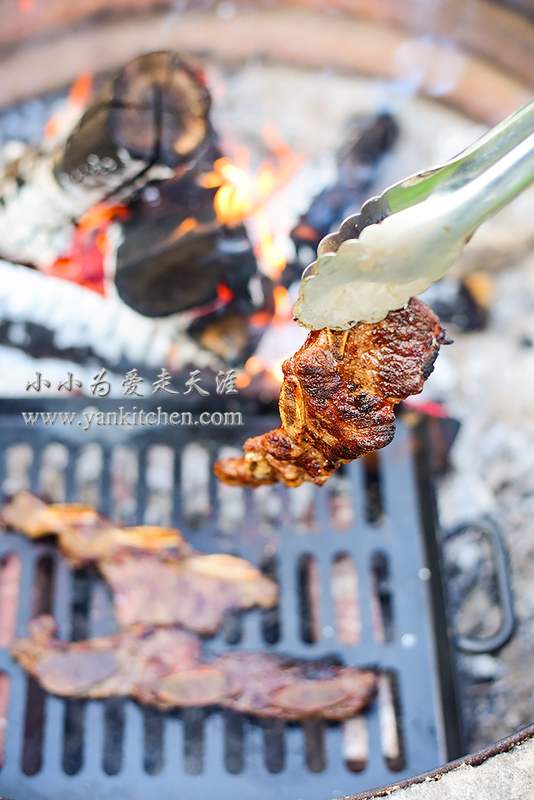 It is perfect for grilling. Flip them over when half cooked. To be honest, they are as good as I expected. The chocolate coated waffle cone is good. But chocolate is too thick to chew. After dessert, we go hiking in the park for a while before it gets totally dark. The moon hasn’t risen yet. 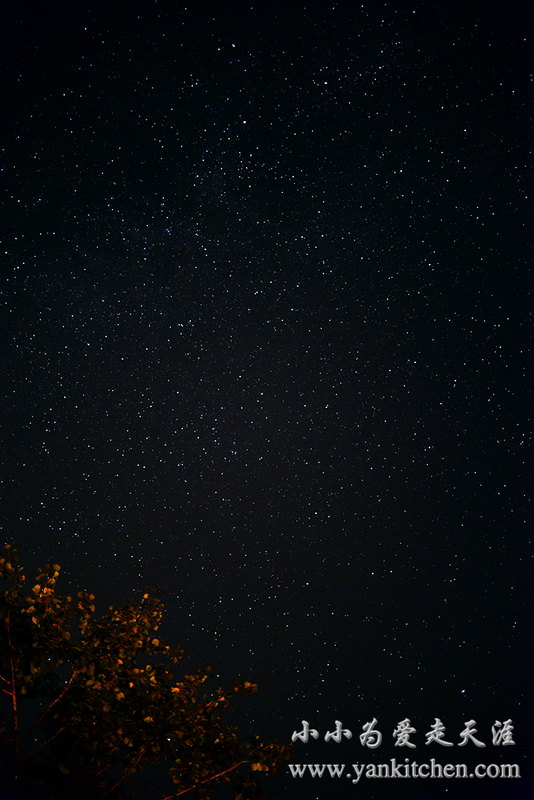 When we look up, we can see the amazing star night sky. The sparkling stars are so bright and beautiful. We walk to the lakeshore to get a better view. We have been living in Michigan for years. But we haven’t seen such beautiful stars before. I wake up early the next morning; sneak out the tent to watch the sun rise. My husband is up too. We start another campfire for breakfast. Heat a cast iron by the fireside. Add chopped bacon. Add diced cooked potatoes. I bought the mini potatoes from local farmer’s market. It is one of my favorites. Grilled corns are sweet and light smoky; very tasty. You think the breakfast is over? I add a couple dark chocolate with caramel filling to cookies and briefly heat them up by the fireside too; just warm enough to melt the chocolate. Ok, now it is time to dissemble the tent and pack. I have my camera and keys locked on shore and take just my phone with me. Traverse City downtown rive doesn’t look pleasant this time. So we turn around back into the lake. 4 hours later, we get back to the shore and ready to go home.